Ben and I are currently doing the Annapurna Circuit trek… and one of the nice things about doing this trek with plenty of time on your hands is that you can elect to do any of the numerous short side trips that pop up along the way. 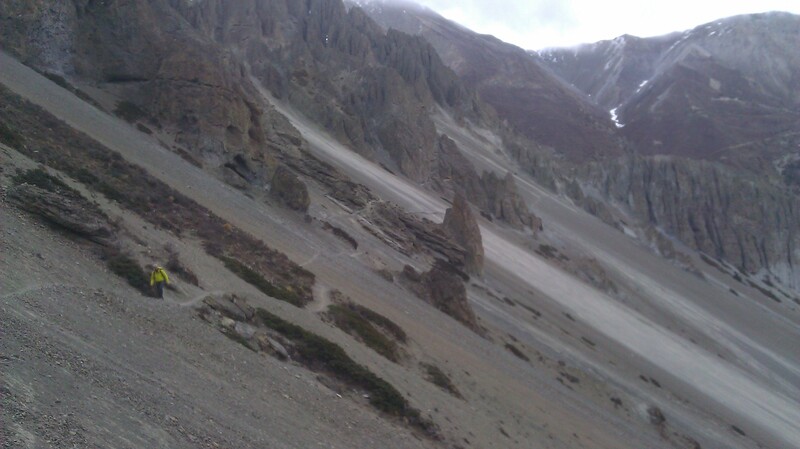 For example, on the 6th day of our trek we had to stop for an acclimatization day (i.e. sleep at the same altitude two nights in a row to let your body adjust to the ever increasing heights… by this point we’d already gone up and down a total of 3,840 meters / 12,800 feet), so we decided to check out the nearby ice lakes… only a 1,200 meter / 4,000 foot climb away (for acclimatization it’s good to go up in altitude and come back down to sleep). Aside from the climb being pretty hard, not bringing enough water and getting lost on the way down (we tried to follow the creek all the way down, as our 14-year old guidebook suggested you could, but it turns out that you can’t… about 1/3rd of the way down we had to climb out of a ravine, over some very spiky plants and follow antelope tracks up and back across the ridge to get back to the trail… not the best move in a place like this… btw, this is called foreshadowing) the trip was great… it was a beautiful clear day and the views from the lakes, and the lakes themselves, were spectacular… I think we were both pretty happy that we had made the effort. With that in mind, on our map, we saw another side trip we thought would be worth pursuing… climbing up to Tilicho Lake, advertised as the highest lake in the world (how could we say no to that). This trip would be a little longer… most likely three days… one day to get to base camp, one day to go up and see the lake and come back to base camp, and another day to get back to the main trail… easy peasy right? Well… it turns out it’s not as easy as it appears on the map (it also doesn’t help when your map also has the trails to the lake in the wrong places… something we found out later).. We started out from a village named Braga early in the morning to give ourselves time to run some errands in Manang (the largest town in the area… i.e. where we could buy some necessary supplies) before heading out to Tilicho Base Camp (from where we’d go up to see the lake the following day and spend the night when we came down again). 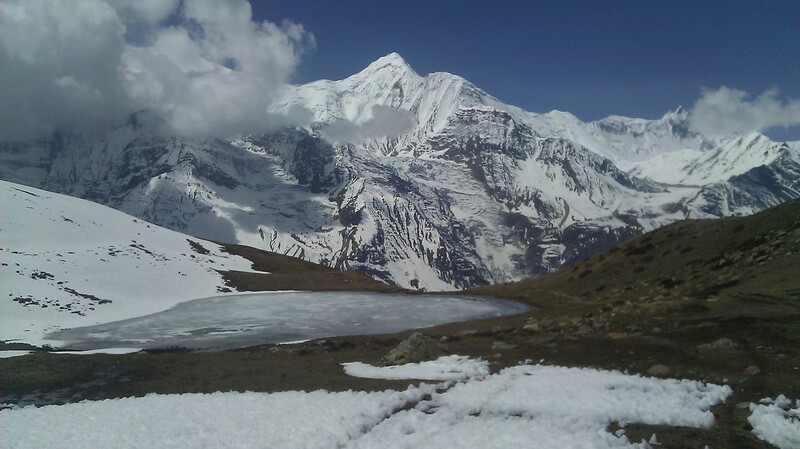 One thing to note here is that the day before, after we had come down from the ice lakes and were safely ensconced in our hotel, it had snowed during the evening… however, none of the snow had stuck (just a light dusting on the higher mountains). Note over… on our way out of Manang, we began to run into other trekkers coming from the direction of Tilicho, and naturally we inquired about the state of things in that direction. The first two of groups were not exactly encouraging… they said that the low route was closed (there’s two ways to get to Tilicho Base Camp, one low, and one high… the high route being a very difficult climb/descent), but they couldn’t really say why, it was just something they’d heard at the next village. We decided to press on (don’t really trust rumors… generally better to see for oneself, or at least get multiple confirmations). Luckily, the next group we ran into were folks we had met earlier in the trek, and they had just come from Tilicho Base Camp (thereby quashing the rumor of the low route being blocked, as they had just traversed it). They did note that the trail up to the lake was very difficult, and that the last 30 minutes of it were covered with snow and ice (they had actually gone up and turned back at that point) and that even those who got to the top of the trail couldn’t see anything as the clouds were low enough to cause a white out (later on we met another group of trekkers who had made it up to the top of the trail and confirmed what our friends had relayed). We thanked them for the information and decided to press on anyways (I figured we could rely on my impeccable timing to have a clear morning the following day… and we weren’t really worried about the snow and ice for some reason… you all can see where this is going right). 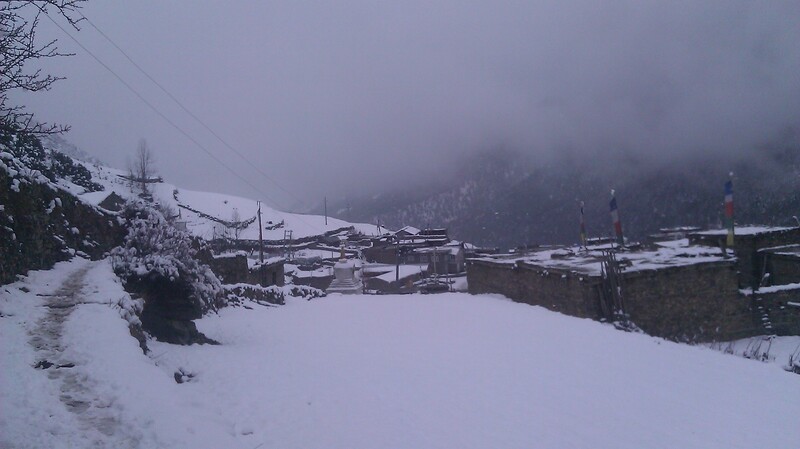 Then about two hours out of Manang (with about 4 hours to go to get to base camp) it started to snow. However, again, other than having to put on an additional layer or two for warmth, we didn’t really think much of it given the dusting and lack of accumulation from the night before… after a bit more hiking we pulled into a teahouse for lunch as the snowfall got heavier. Far from being dismayed, the snowfall actually confirmed our latent expertise in late April Himalayan weather patterns… because as we finished lunch, the snow fall eased, and none of it had stuck… we okay, maybe just me… don’t want to put words in Ben’s mouth) secretly rejoiced at how smart we were and continued on (could the warning signs be any clearer). One thing everybody had failed to tell us is how dangerous the last several kilometers of the low route actually is… the trail cuts directly across an active landslide area… and by area, I mean several kilometers across an entire mountainside that is basically made up of gravel. Another thing nobody told us about is that the “low route” through this particular area is a rather steep 400 meters, approximately, above the river (i.e. if you slipped and fell, or, worse, were actually caught in a landslide, you’d be sliding/falling about the distance of one lap around a track before you’d reach the river below… at one point I actually rolled a tennis ball-sized rock down the hill, and it took almost an entire minute to roll down to a point slightly above the river where I couldn’t see it falling anymore… yes, I timed it). The hour it took Ben and I to cross this area was not fun… along the gravel mountainsides part, the trail was about 10-12 inches wide, and there were some definite slips and small slides along the way. Even the seemingly safe spots near the solid cliff-side rocks contained some very steep downhill sections, which, when you’re on gravel, and as large as Ben and I, give way and cause slips. 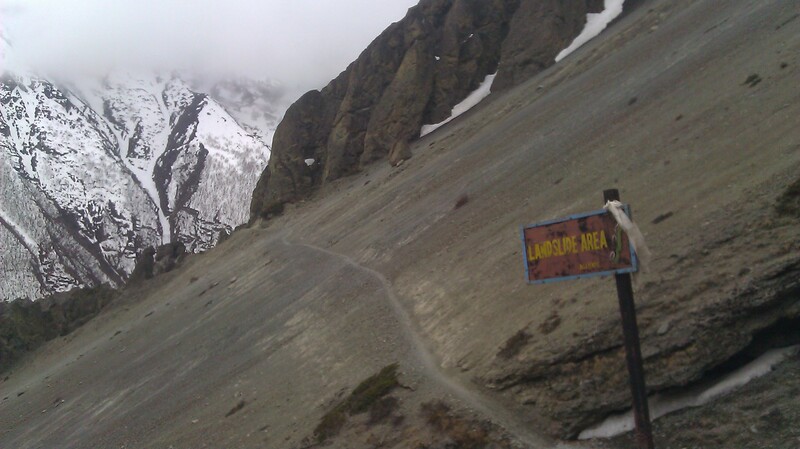 We were both very relieved to turn the corner (and get off the landslide area portion of trail) towards base camp. As an aside, treks in the Annapurna region are known as “teahouse” treks because in every village one passes, there are lodges to stay in and restaurants to feed you (usually one in the same, and you can get a room for basically free… about $0.60… if you agree to eat at the lodge’s restaurant, which is generally overpriced by Nepali standards). However, the quality of the teahouses varies from place to place. Aside over. Tilicho Base Camp consists entirely of two teahouses (we were told one was better than the other), the one at which we stayed had an L-shaped building for the rooms (our room having thick earth/clay walls, and swept earth floor, a wooden ceiling, two cots, two smelly, albeit thick, blankets and no power… I’d say there were about 12 rooms total), one building containing two toilets (the squat-style variety… again, no power, and also no running water) and one main building containing the eating area, the kitchen (no running water either) and, the thing that made this lodge preferable over the other, a dung-powered heater (for power there were two or three very weak solar-powered lights… and it had been cloudy all day). We arrived around 4:00 PM, dropped our stuff in our room and cleaned up a bit (I took a hot water bucket shower… the hot water is nice, but the air is still freezing, so you’re shivering the whole time, and you have to stand right next to the squat toilets as the bathrooms the only place one can wash… and it’s not the biggest structure ever… but I’d rather be clean a bit cold than warm and dirty). Afterwards, we joined the gathering around the heater with the other folks staying the night. We socialized a bit, talked with some folks who made it to the lake that morning (their advice, go early before the sun gets up and begins to melt the snow and ice on the trail) and played some cards. Once it got dark (the sun goes down around 6:30ish) we had dinner and sat around the heater for as long as we could (there’s no heating in the rooms) trying not to freeze… Tilicho Base Camp is at an elevation of 4,150 meters (13,800 feet), so it’s very, very cold at night… I don’t know the exact temperature, but I can tell you that, even sitting around the fire, I had on two pairs of socks, jeans, tights under my jeans, two long-sleeved shirts, a sweater, a jacket, a scarf and a hat, and I was still cold (and I, generally, am fine with being on the colder side of things). We turned in around 8:30 and read for a bit before trying to fall asleep while still freezing (after some time goes by, your body heat in the sleeping bag and under a very thick blanket generally makes you warm enough to fall asleep… provided no part of you, sans a small part of your face, is actually exposed to the air). We woke up at 5:30 AM the following day (the sun comes up early, so it’s generally light beginning round 5 AM or so, and we had planned to get an early, i.e. 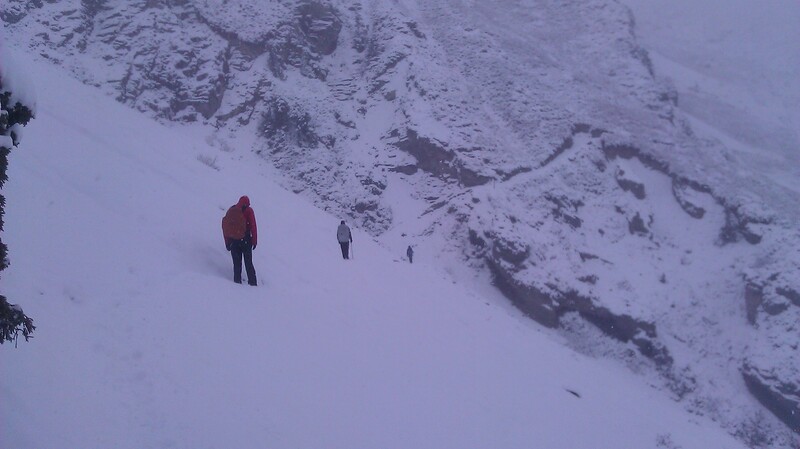 6 AM, start on the climb up to the lake) and, looking out the window, noticed that things were… how shall we say… awry. There was about 8 inches of snow on the ground already, and lots and lots of snow was still falling… not exactly the thing one wants to see when one is in a very basic, remote place high up in the Himalayas and the only route out traversing several kilometers of landslide area with the trail buried in snow (how could anyone have seen this coming I wonder). My impeccable timing, apparently, had worked in reverse… instead of a beautiful sunny day (the best possible outcome), we had gotten a giant snowstorm (the worst possible outcome)… that just seems to be how it works with me though. Clearly, the trip up to the lake was off as we had more immediate worries. Ben and I began to debate possibilities… there really only being two, stay in place and wait it out (for who knows how long) or leave asap over the trail we came in one (the high route would be impassable with all the snow, nor did anyone really know where that trail actually was). We saw a couple of other people beginning to stir and went to get their thoughts… and here’s where a little bit of luck was on our side. Two girls from Belarus were staying in our lodge, and they had hired a local guide to take them up to the lake and back. The other six of us that were awake eagerly asked him his opinion of our situation. His response… “get out now,” and he was planning on taking the two Belarussians and one Quebecois with him. That seemed to settle it… we were leaving (in reality, there was a bit more discussion, a couple of factors that pushed us toward leaving… the guide was local, i.e. from two villages over, so he knew the area and the weather, the guide would be leading the way so we could follow in his footsteps, literally, in the snow, the guide noted that as long as it stayed cloudy and cold there wasn’t an avalanche risk as the snow would stick, the two girls felt their guide cared for them and wouldn’t be irresponsible towards their safety, there were four other guys, besides Ben and I, willing to go as well, and Ben and I couldn’t really get an answer out of the lodge owners as to how much food and wood was left to determine how long we could stay in place if the storm turned out to be much longer than expected… not their fault really as I don’t speak Nepali… in retrospect, we would have been safe staying in place, but it was not an appealing prospect at the time). We all ate a quick breakfast and the guide, the two girls from Belarus and the Quebecois guy set off (the guide didn’t want big groups trudging over the trail all at the same time as that increases the risk of the trail giving way… he said we could follow him, but kind of warned us not to get too close… five or ten minutes difference would be fine). A Swiss guy and a German guy set off next, about five minutes after the guide’s party. Then Ben and I, plus another American and a Quebecois (both guys) anxiously set off when we finished packing up… about ten minutes after the Swiss / German pair. The snow was still coming down hard, so it was a bit hard to see (the other two guys had on sunglasses, but mine kept fogging up, so I didn’t use them). Also, I, of course, don’t have proper hiking boots… I had been walking this whole time in running shoes… not the best thing for snow and ice (Ben, luckily for me, had brought some plastic bags that I could put my socked feet into before I put my shoes on, to at least keep my feet dry, which actually ended up working like a charm). The first kilometer and a half or so outside base camp went alright… again, it was somewhat hard to see because of the snow, and I did slip a little on some of the steeper parts, but this part of the trail wasn’t as bad as what was coming up (actually, when, or if, you could step back for a moment, the scene was actually quite beautiful… falling snow, a lovely valley, impressive mountains and a semi-roaring river down below… but ,I more or less, had to look down and watch every step I took, so I wasn’t exactly focused on the scenery). Now… I have to admit that as we turned the corner to the dangerous part of the trail that I was scared… not just anxious, but actually scared (the trail was scary enough the day before… and that was in good conditions). The American guy with us had some mountaineering experience, so he gave us a little chat on what we should do as we crossed the trail (only go when the guy in front of you has reached a safe space, if you, god forbid, actually get in an avalanche, try and ride it down on your pack, if you get buried, spit to find out which way is up and start digging). With that, we set off one at a time across the open areas. Now, the guide’s party and the Swiss / German duo had gone before us, so there were footprints marking the trail (and, thankfully, no horrendous slip marks or people screaming about people falling), so that made it bit easier than it would have otherwise been. When it was my turn, before I’d go I’d try and figure out the halfway point between the safe spots (just in case I somehow managed to hear something falling fom above and had some time to run to the nearest safe spot… not that I actually knew if I could run on the snow or not… or outrun an avalanche… details, but it did give me something to preoccupy my mind with). Then, when I started walking, I’d try and step directly in already set footprints (as my tennis shoes would possibly slip if I had stepped on non-packed snow), always watching my steps carefully and trying to avoid the footprints where they had slipped a bit downhill. Slowly but surely (and anxiously) we all made our way across, continually checking in with each other to see if everyone was alright at the safe spots. As I walked, I got a bit more comfortable (no looking down though), but every time I relaxed, or shifted my gaze away from my feet, I’d slip a bit… a small, luckily, reminder to keep me focused on the business at hand. After a very tense hour and a half or so, we made it safely across the landslide area (we’d even caught up with the Swiss / German pair on our way across). It was still snowing, and cold, and we still had a decently long way to go before we were out of there, but we all (and I’ll speak for everybody here) felt relieved to be done with that part of the trail. As we walked on, the American guy and Quebecois just took off (not very nice of them), so Ben, I and the Swiss / German duo formed a little group to keep a watch on each other. 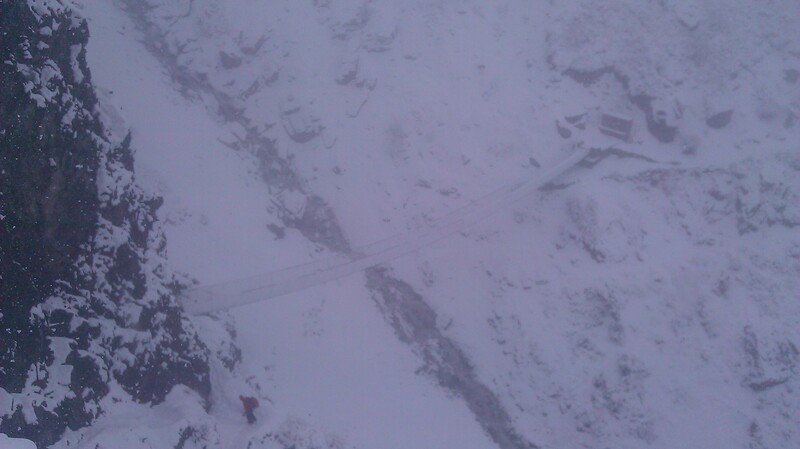 The snow kept coming down, we passed some yaks just milling about, and it was relatively easy walking, but we all knew there was one more dangerous part of the trail between us and the nearest village… the steep descent down to the one bridge we had to cross. 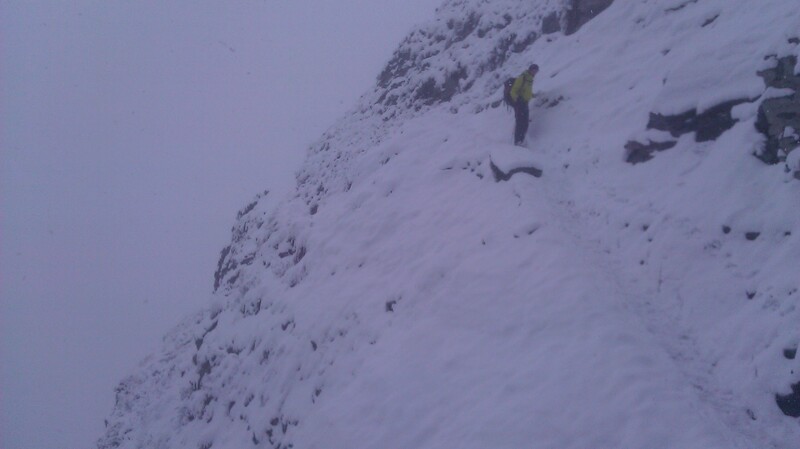 When we reached the top of the descent, we all cracked some black jokes about falling and wished each other luck. The Swiss / German pair went down first while Ben and I ate some candy bars for energy (and a mental calming effect). Once our turn came, we followed in the same manner… facing up hill (or cliff in this case), perpendicular to the trail, side-stepping / shuffling down the switchbacks. In my shoes, even with the side-stepping / shuffling, I was basically engaged in a controlled slide as I slipped my way down the path… only really scary on the turns that faced outward over the cliff edge. Again, slowly but surely, we made it safely down and across the bridge. Another hour later we made it to the first teahouse and stopped for some tea and food… all four of us were exhausted, not just physically, but mentally as well. 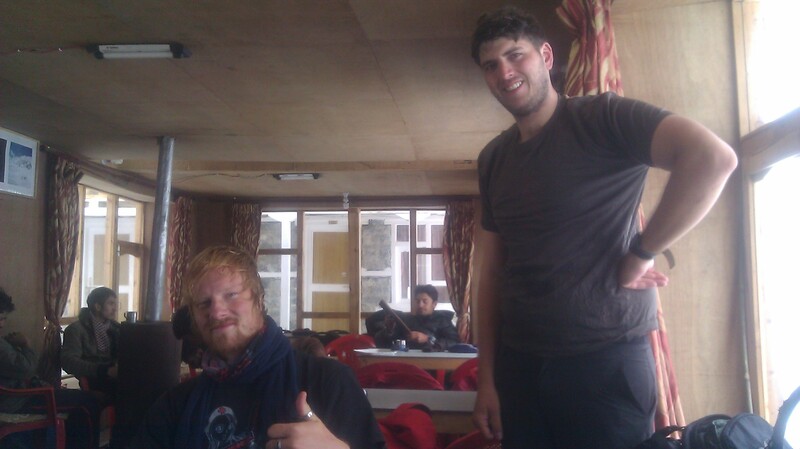 We all ended up spending about an hour just sitting there… recovering, drying off and warming up. Ben and I said good-bye to our now new friends (as they were headed a different way) and we made our way further downhill (still in the snow) to the next village where we found a hotel to stay in for the night (and possibly longer if the storm continued and we had to wait it out). Exhausted but thankful to be alive, we both ended up instantly crashing for 2-3 hour afternoon naps (we both barley got out of our shoes, or boots in Ben’s case). The morning had turned out to be quite the adventure… and also something I never, ever, want to have to do again. Finally… the view as we made it back to a village. Scary reading! I’m glad you are safe. What a memory my friend. Glad I read this after your email so I knew ahead of time you were safe. That’s a pretty scary trek. 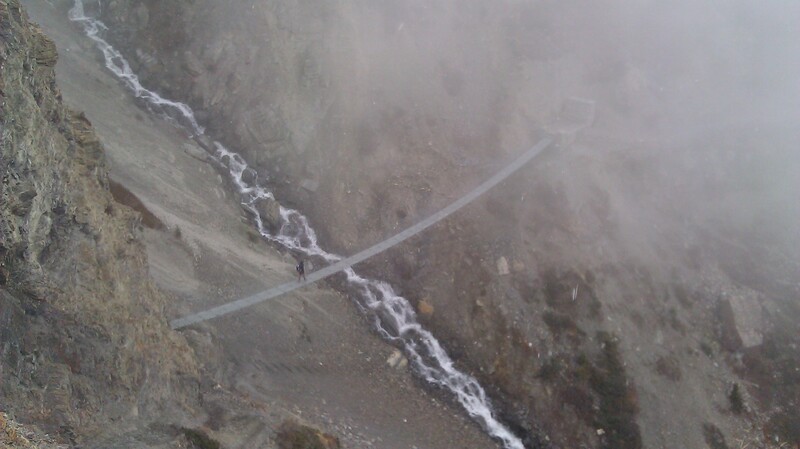 Wow, the mountain and the bridge look incredibly treacherous….this entire experience sounds terrifying. Glad you guys are safe. The yaks look cute…though I read once that when trekking in Nepal you are advised to always walk above yaks (when on an incline) because if you walk below them, they tend to charge at you unexpectedly and ram you off a hill or cliff…and now that I see your pics of such “hills” I have a completely different understanding of how dangerous it is….be careful! Hope the rest of your trek is not such a harrowing experience! 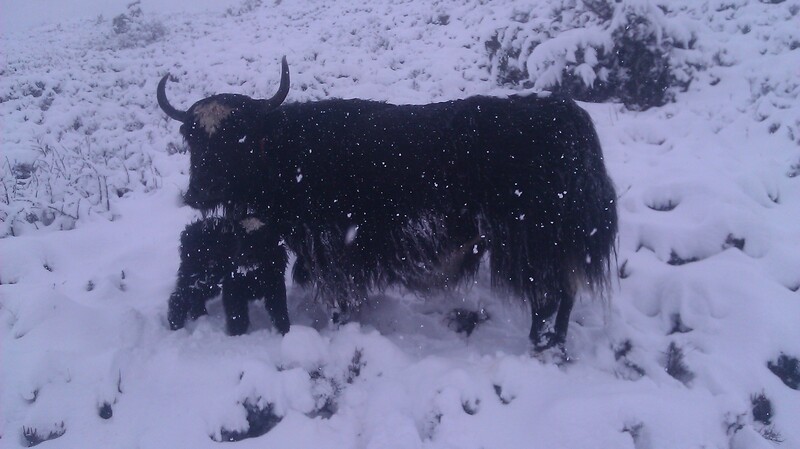 I heard that about yaks as well before I came… but turns out they’re very courteous, and a bit skittish around humans as well, so they’ll actually move off the trail and go around you (most of the time anyways).